Few artists get the chance to recreate artwork that has had an effect on their own craft. 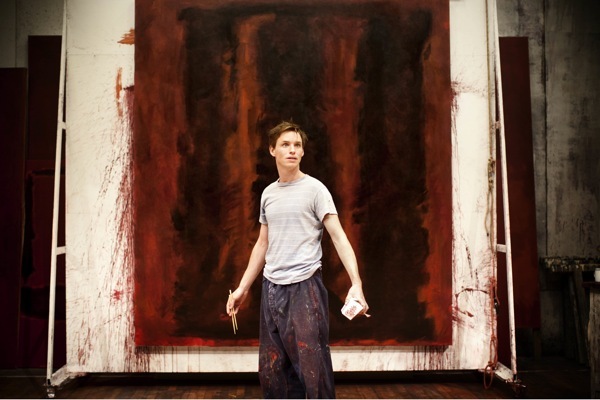 British set designer Christopher Oram, who is nominated for a Tony for his work in Red, got to do just that with the Mark Rothko murals intended for (yet which never became a part of) New York’s Four Season’s restaurant. 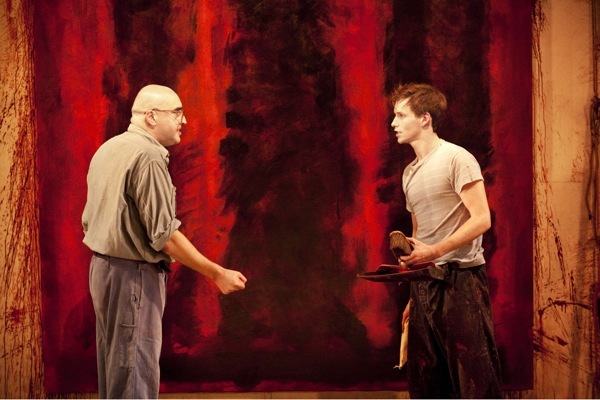 The play features Alfred Molina as the American painter who squares off with his young assistant (played by Eddie Redmayne) over the elements of art, as well as the struggle for student and teacher. The minimalist production, which is up for seven Tony awards, including Best Play, rests on the shoulders of two actors and the massive canvases on display in Rothko’s Bowery studio. In a phone interview from London, Oram (who pulls double duty as the show’s costume designer) told Stage Rush about the building sets in one week, the luxury of being picky about projects, and keeping tabs on a show once it’s opened. What were your thoughts or reaction when you found out you were nominated? Very excited. I wasn’t expecting it at all. I don’t consider my work to be flashy like [the work that the Tonys tend to recognize]. What I do is make the play work, and that’s good enough or me. When it gets recognized, that’s good for me too. What does the Tony nomination mean to you? I haven’t done a good amount of work in United States. To work on Broadway is a major achievement, as is to be recognized at this high level. The play itself has been successful in connecting with audiences. I believe in it, and in the writing. When it was offered to me, I felt it was an important and exiting play and wanted to be a part of it very much. As a set and costume designer, you read a new play and you try to asses if you like it and if the audience will like it. It’s difficult with new works, because with works of Shakespeare, you know there will always be an audience for it. Red is unique and has no history as a piece. You’re looking to create an audience for it that will be interested in the subject matter. It’s great to find a play that makes a connection. What are some of the responsibilities of set designing? Design is a discipline and it covers everything about the piece. These days, there are fewer boundaries to each person’s work. The crossover between lighting affects video designers, which affects set designers. I worked very closely with Red’s lighting designer, Neil Austin. The description of Mark Rothko’s studio was key about how he controlled life. I knew I had to have close dialogue with Neil about how I would design the space, how he would light the play. What are your goals when you begin designing? The boundaries of making scenery are holistic—it’s about entering the world of the play. Sometimes it doesn’t mean you have to do a complicated set. That’s an American trend. These days, it’s not quite as clear-cut as that. I think the cost of building scenery has become more prohibited. You can’t continue to build castles. There are two types of shows: there’s the huge Shrek shows and there’s the Spring Awakening-style shows. One is old fashioned and scenic, while the other is a more modern approach. I think a lot of audiences want to pay a lot of money and see a lot of scenery. Get more bang for their buck. Take me through the process of set designing. What’s the first step? The contract. [laughs] It starts with the author. You get the play, you read it, and you decide if you have a response to it. I do a fair amount of work. I don’t have to take everything I get offered. I can choose my projects and that’s important. If you do something because you have to, you don’t necessarily do the best work you can. You have to want to do it and do it well. I have an innate response and I have something to give to it. You have to have a gut instinct, a need to explore that piece. How much time is spent at the actual theater, as opposed to in a studio where the sets are built? Sometimes the sets are simple to make. It usually takes four or five weeks for build time. When we put up Red in New York, it was a very quick turnaround. We had already done the production in London, but it made sense to keep the energy alive, keep it flowing, instead of sitting on ours hands. I was there for about a week and a half. My year was already booked when we got the news that Red would transfer. I didn’t stay for the opening. I’d gotten to see the first preview, but I was already on to my next project, which is Madame Butterfly at the Houston Grand Opera. What do your duties consist of once the show opens? You set it up and you leave it in the hands of people that run the show. For any show I’ve worked on that’s running, I receive the show report every day. It includes how long the show ran that night, if anything went wrong, and any local reports. When there was the bomb scare in Times Square, that was included in the show report. My job is to have a good relationship with the crew so that they know how to look after it when I’ve left. By being commissioned to design the costumes as well, does that make your work harder or easier (since you have control over another aspect of the play)? Easier, but it depends on the play. In a Broadway sense, Red is non-costume. They’re very real work clothes. The actors do all that physical work and they have to get dirty. I wouldn’t design something that makes the actor feel uncomfortable. If an actor wins Best Actor, it means everyone involved won, because everything naturally worked. You all got it right. You’ve done quite a few productions where you’ve served as both set and costume designer. Which do you consider yourself first? I would never separate the two. I was recently offered something that wasn’t the costumes and only the set, and I didn’t want to do it. For me they’re intrinsic. Dressing the human form is as exciting as carving a three-dimensional space. I know there’s Broadway magic and everything, but it seems these two guys get your set pretty messy through the course of the 90 minutes. How does it get cleaned, and how did you design it so that it could be cleaned easily? I didn’t. It is what it is. It gets mucky—so did Rothko’s studio. The show is short, but the evening goes on. The crew mops the floor down, takes the canvases down, and prepares the paint for the next day. They’ve got it down to a fine art. Nothing in the play is contrived. It’s real paint, real pigment, it gets heated up as proper artists do. That’s why it’s so exciting. It smells of fresh paint when you walk into the theater. It’s a real working studio. How close is your set to Rothko’s actual studio? It didn’t matter that it was an exact replica. I didn’t have to recreate the actual footprints. What we needed to achieve what the sense of it being hermetically sealed, that it was slightly claustrophobic. It’s a bare pit with the two characters in it. How did it feel having the task of recreating Rothko’s paintings exactly? Those paintings have existed in London since I was a kid. They are extraordinary. They effuse extreme physical presences. Viewing them was a very profound experience. It remains with me always. This production allowed me to explore something that was my own experience. The growing trend of projections and video in theater blurs the lines between scenery and lighting. Can you talk about your collaboration with projection/video designers? With Frost/Nixon on Broadway, we used video, not projection. It was a play about the media—it was in its genes, so it had to use video. All the TV monitors on the back wall were kept at mid shot the entire play, and then at the end when it gets closer closer and closer, you got what the TV got and what the play was driving at—that Richard Nixon was brought down by TV and the media. In the right context, video and projection can be great. It can also muddy things visually. You have to have the lighting and projection working closely in harmony. It can be genius when it works well. 3D movies like Avatar, where 3D is at the heart of what it is—that works. Other films that stick the 3D effects in at the last minute—you’re just using that because you think you’re making your project juicier. Projection could be like that too. I would only want to use it where I felt it was appropriate. National Theatre doing Danton’s Death in July. 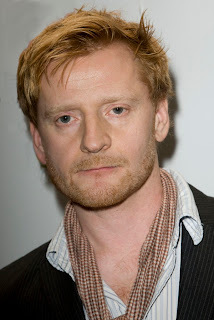 Passion at the Donmar Warehouse in September. Houston Grand Opera to do Madame Butterfly in October. King Lear at the Donmar in December. Any word on what’s happening with the rumored transfer of the West End’s Evita to Broadway? You probably know as much as I do. I hope we get to do it. It’s very dear to my heart and I’d love to reexplore it. They’ve been talking about it. Rumors are as true as rumors are. So many British productions came to Broadway this season and received Tony nominations, including Red, Hamlet, which you were also involved in, La Cage aux Folles, A Little Night Music, and Enron. Why do you think British productions have such success on Broadway? It’s hard to know, isn’t it? If the show is good, it will work on Broadway or Patagonia. There is no magic recipe that makes it all happen. Red is about a New York artist. It’s an intelligent play; it’s not an easy ride. I imagine that’d appeal to a New York audience. What are your thoughts on the surprising failure of Enron on Broadway? It’s a piece unique unto itself. It’s not really for me to say. I can understand why American audiences wouldn’t take to it. It’s kind of exiting, its success in UK and not in the US. Same language, two cultures. In Red, Rothko and Ken go back and forth in the play about what red means to them. What does red mean to you? It’s at the heart of what I do—with color. I don’t choose to work with color a lot. I’m a monochromist at heart. I have red hair. It’s at the heart of me—it’s in my genes. My mother Kathryne Oram – her grand father and great grandfather: John Samuel Oram. Founded the J.S. Oram Co. in 1800’s in Cleveland, Ohio, USA.